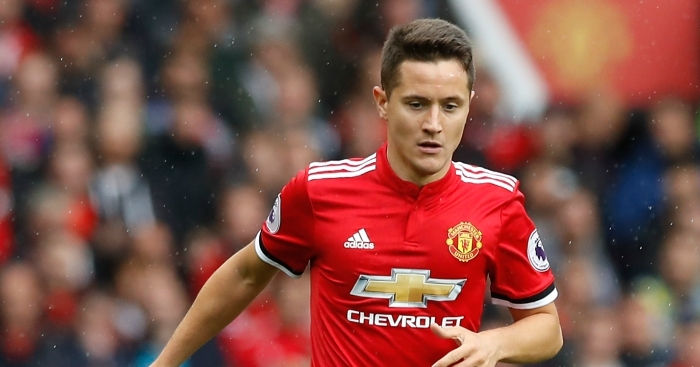 Ander Herrera isn’t the most famous of professional Spanish footballers but he has definitely earned the admiration of soccer fans across the globe as a midfielder for the Spain national team and of course, Manchester United of the English Premier League (EPL) – also known as the Red Devils. Individually, this Spaniard has been honored severally. In 2011, he was named among the UEFA European Under-21 Championship Team of the Tournament. Also, the 2016-17 football season ended with him making the UEFA Europa League Squad of the Season. In addition to that, he received the Sir Matt Busby Player of the Year award and was recognized as the 2017 EFL Cup top assist provider. As part of the Manchester United team, Herrera has bagged the UEFA Europa League, the EFL Cup, FA Community Shield, and FA Cup. The following are the things you may need to know about the footballer. It was on the 14th of August and in the year 1989 that this Spanish Red Devils’ midfielder was born to his parents, Pedro Maria Herrera and Yolanda Aguera. His place of birth was in Bilbao, Spain which was equally where he was brought up. While almost nothing is known about the woman who birthed this soccer star, it is a common knowledge that his dad, Pedro was a footballer and equally a midfielder. He played professionally for Real Zaragoza in Aragon where his son would later kick off his own career. Ander Herrera’s youth career which began in 2001 and spanned through 2008 was spent at Real Zaragoza. It was with the Spanish football team that he started his senior career, first with the reserve team – from 2008 to 2009 – and then with the first team – from 2009 to 2011, before joining Athletic Bilbao later that year. He stayed with the team until 2014 when he found a new home in Old Trafford. This bloke was one of the guys Louis van Gaal brought to Manchester United. He joined the Red Devils in June 2014 and started featuring in Premier League games. Adjusting to English football wasn’t a big deal for Ander, as he quickly found his place in the league and soon emerged as one of the club’s playmakers. He won the Sir Matt Busby Player of the Year Award in 2016/17. Representing Spain on the international scene, he has blazed for the country’s Under-20, Under-21, and Under-23 squads, making about 30 appearances in total and finding the net no fewer than seven times. Ander was invited to join the nation’s senior team in October 2016, he eventually debuted at this level against England in November 2016. Anyway, Ander isn’t incapable of love, although he is yet to get married, we can tell his heart throbs for Isabel Collado as much as it does for football. The lady has been the love of his life for quite a while. In fact, it has been upheld in several quarters that the two are having an informal marriage. Though they haven’t had any religious or civil ceremony to mark their relation, they have been cohabiting, even building a family together. So far, the Ander-Isabel relationship has seen the birth of a child. Hardly can anyone tell what’s up with Isabel, the things going on for her has been largely overshadowed by the career of her man. The duo has been spotted on several occasions having a good time with their young daughter. Beyond being skillful, physical fitness largely determines a player’s performance in soccer. In fact, any player without a satisfactory level of the fitness attributes desired of footballers would be a liability to any team and is bound to have a disappointing career. As such, maintaining a decent anaerobic endurance and sturdiness is a priority for the soccer guys, this is why they constantly train and work out to sustain a physique that would guarantee flexibility, agility, speed, strength, and stamina. Thankfully, Ander Herrera has little to worry about in this regard. While he can’t do anything to alter his 6 feet (1.82 m) height, he has maintained a body weight that’s proportional to the height. The Spanish midfielder weighs (73 kg); his waist, arms/biceps, and chest respectively measure 33, 14, and 39 inches.